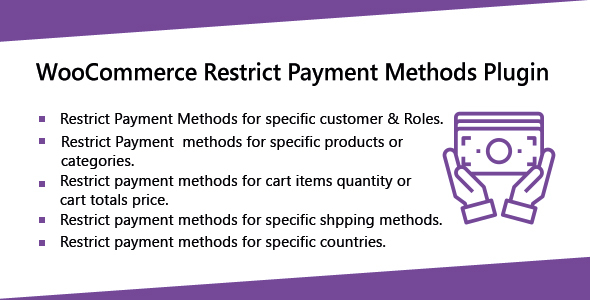 WooCommerce Restrict Payment Methods Plugin allows store owners to enable restrictions on specific payment methods by multiple conditions like cart price, cart items quantity, disable specific payment methods for specific product & categories, for specific customer & roles, for specific shipping methods applied on cart. The customers will be able to purchase items with the particular payment method. The plugin will be helpful to sale items by specific payment methods. Disable specific payment methods for specific customer & Roles. Disable specific payment methods for specific products & categories. Disable specific payment methods for cart items quantity. Disable specific payment methods for specific shipping method applied on cart. Disable specific payment methods for cart totals amount. Disable specific payment methods specific countries. Countries can be detected by users billing, shipping address and IP address. Show custom error messages when no payment method is available.